This month we consider An Unkindness of Magicians by Kat Howard and Spoonbenders by Daryl Gregory. Magic always has a price. For generations, that price has been hidden from the powerful families who use it. Now the Turning has come, a time when the Great Houses of the Unseen World challenge each other for dominance; a time of change, when anything can happen—and those outcast have returned to claim their due. Author Kat Howard brings together some of the best-known names in magic in a darkly glittering novel where the inhabitants of the Unseen World live and work alongside modern-day New York City. The descendants of Merlin, Shakespeare’s Prospero, and the alchemist John Dee are among the core elite of the Great Houses who will battle to maintain the status quo. Sydney—an outsider with no last name—has earned some small freedom from her indenture to the House of Shadows, and has been contracted by Laurent Beauchamps as his champion in a bid to elevate his family’s fortune and be recognized as one of the great Houses. Laurent’s best friend, Gray Prospero, the disinherited son of Shakespeare’s Miranda, has his own designs on the outcome, and his own way of tapping the power he needs to get his way. The stakes for the Houses are largely political; for the individuals involved, they are personal; and for those on the fringes of the Unseen World, they just might be life and death. Sydney must defeat the House challengers while navigating the waters of family feuds, ancient compacts, missing cousins, and the terms of her own freedom. Howard has a knack for finding the magical in the everyday (the Angel of the Waters statue in Central Park houses a potent spell), and conversely, the everyday in the magical (“Even magicians need lawyers,” we learn, and it turns out that they can be lawyers, too). 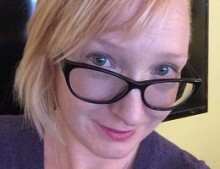 Her previous novel, Roses and Rot, explored a complicated relationship between sisters, set against the backdrop of an artists’ retreat and steeped in the context of fairy tales; in An Unkindness of Magicians she looks at a different type of family fractured by social striving, evoking a sense of long history by bringing names of legend into the present. 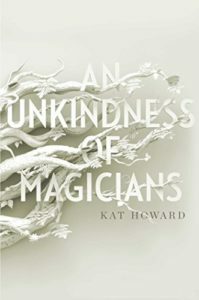 An Unkindness of Magicians is set in a richly-imagined world in which magical duels are fought beneath crystal chandeliers while the spectators sip champagne, as those who make their lives possible are kept neatly out of view. Howard explores themes of corruption, greed, and disparities of power and privilege in an absorbing read that is part murder mystery, part political thriller, and part fantasy underdog tale: When the Wheel ceases its Turning, which House will come out on top—and who will pay the price? All lovers of contemporary fantasy should have this on their TBR list. The Telemachus family has a secret, or rather, two: One, they were briefly famous as the Amazing Telemachus Family for their stage act of mentalist tricks—famous enough to appear on television’s most popular daytime talk show, where they were very publicly debunked and humiliated by the Astounding Archibald. And two, it wasn’t entirely an act. Hardly at all, in fact. Now each pursuing their own lives and livelihoods in ways not always entirely legal or wise, the family must come together as their collective past catches up with them. Their paranormal abilities make their already complicated lives even more so, as along with Irene Telemachus’s foray into the brand-new world of online dating, her son Matty’s discovery that he can actually leave his body (though only under very specific and embarrassing circumstances), and whatever it is that Uncle Buddy is building in the basement, add Grandpa Teddy’s grifting, Frankie’s mafia entanglements, a government agent, and the reappearance of the man who ruined the family in the first place—and letters arriving from the long-dead Grandma Maureen. Spoonbenders is an ambitious book. There is a lot going on here, so much so that I found myself waiting for an authorial misstep, some thread left dangling—to my delight, I found none. 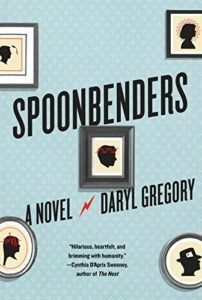 Few authors can make each point of view compelling, but Daryl Gregory has done so, managing to weave the story of each family member deftly into a fabric that feels utterly genuine and satisfying. The arc that binds them all together is that of the enigmatic, unspeaking, and temporally unmoored Uncle Buddy, whose peculiar efforts at home improvement the family abides with sympathy and humor. Half the fun of reading Spoonbenders is the tingle of recognition that signals nostalgia done right. Set in the mid-1990s, with the incessant arrival of new America Online CDs and the whine-and-hiss of a 14.4 modem, there are also looks back at the ’70s with nods to Uri Geller, The Mike Douglas Show, and the Amazing Randi that feel like time travel back to a childhood of staring hard at pennies trying to make them move. (Anyone else?—I thought so.) Gregory’s attention to detail makes the nostalgia feel entirely authentic. Spoonbenders is a convincing and entertaining look at a complicated extended family, with a Stranger Things vibe that captures the feel of the time and place exceptionally well. There is something for everyone here, a story that crosses generations of experience, pop cultures, and genres—a riveting tale with a ton of heart, masterfully told.